I spent my first full day preserving in a commercial kitchen this week. When I first learned that if I wanted to sell my preserves at a farmer's market I would need to make them in a commercial kitchen I was disheartened. 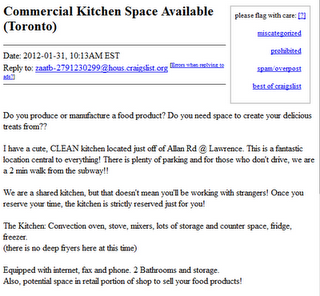 How the hell does one find a commercial kitchen? Well it turns out it is really not all that hard, you just have to hit the ground running. My first stop was Craigslist. 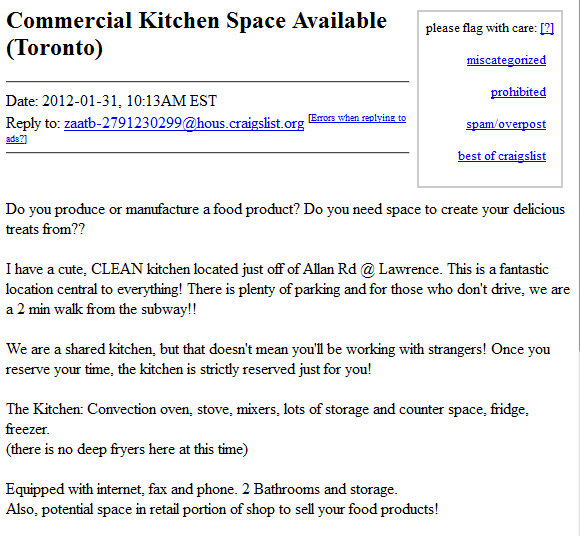 I looked in housing, under 'office/commercial' and stumbled across a couple of ads similar to this one. I got in touch with a couple of them and went and checked two of them out. Both of them were looking to get in the $15/hr range. My next stop was to simply bottle up any insecurities I might have and walk into a local restaurant that I really like and sit at the bar for 30 minutes while I waited for the owner to become available. We chatted, I told him what I was looking for and he was intrigued. He promised to think it over and be in touch. Whew, that wasn't so hard :). Then I did some research on local churches and community centres. There are actually quite a few with kitchens that would do the trick. Fortunate for me, before I could even begin to knock on doors, I heard back from the restaurant. The answer was 'yes'. And better yet, he suggested we barter rather than exchange funds - perfect. The morning of my first day in his kitchen I packed up all the supplies I would need, and I mean ALL the supplies. I wanted him to not even know I had been there. Pots, measuring cups, bowls, tupperware, soup ladle, funnel, jars, every ingredient I would need, pot lifter, towels, dish rag, knives, paper towel, hand soap, timer. I brought it all. I also brought him a jar of my orange onion jam with sage and thyme and in true creative fashion, he began to talk about the different ways you could use the jam. Some of them had never even occured to me. Within minutes he was making a pizza with the jam, parm, prosciutto. It was delicious. I don't think you could have punched the smile off my face.